Come by The Patch Works Art and History Center (593 Gaskill Street SE) on Sunday, 11/18 from 3:30 – 5:30pm for a special public lecture that Rebecca Page, Ashley Cheyemi McNeil, and Brennan Collins will be giving. 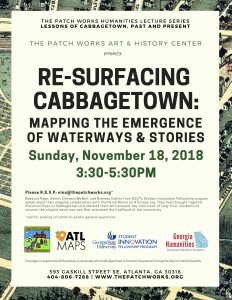 Their lecture, “Re-Surfacing Cabbagetown: Mapping the Emergence of Waterways and Stories,” discusses how maps can show a non-dominant narrative about place and excavate multifaceted histories of a community. Collaborating with Nina and Jake Elsas, founders and curators of The Patch Works, the ATLmaps crew mapped interviews conducted by the Elsas with long-time residents of Cabbagetown, and layered these talks into fascinating historical maps of the neighborhood –– in the process, they uncovered how the lore of a town can sometimes be more reliable than “official” cartographic renderings of that same place. 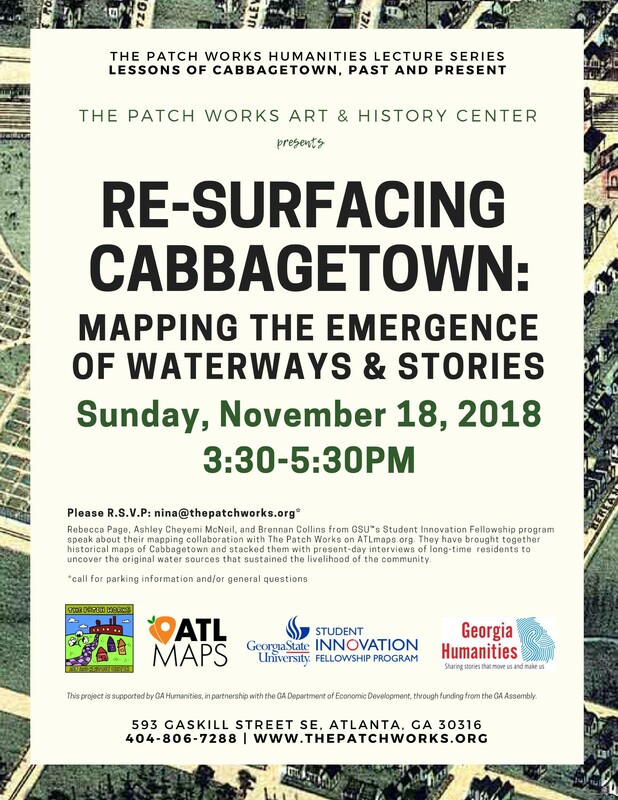 This event is free and open to the public, thanks to a community grant that The Patch Works was awarded by the Georgia Humanities Alliance. Please RSVP to Nina Elsas at nina@thepatchworks.org so they can plan attendance numbers.